American Lyric tenor Mark T. Panuccio has been praised for the "exquisite lyric beauty of his voice, dramatic expressiveness, unfailing musical sensibility and professionalism" in Opera News. 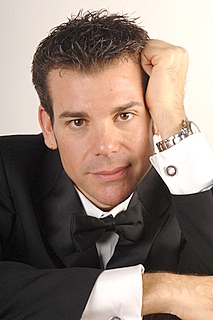 He is consistently engaged by noted companies in the USA including Cincinnati Opera, Sarasota Opera, Opera Pacific, Utah Festival Opera, Nevada Opera, Michigan Opera Theatre, Opera Carolina, Portland Summer Opera, and the Opera Company of Philadelphia, and appears at Il Festival dei Due Mondi in Spoleto, Italy. He features on the new recording of Menotti's The Saint of Bleeker Street under the baton of Richard Hickox on the Chandos Label. "I've always wanted to be a singer ever since I was a little kid; I first sang in public when I was in kindergarten," declares Panuccio, as if he never had any doubt about what he wanted to do in life. It's the day after his debut with the Arizona Opera Company in early October, and he's relaxing over lunch at Cuvée, one of Tucson's pleasant eateries, enjoying a salad and a glass of red wine. "It's okay to have a glass now that the performance is over," hinting at a life filled with hard work, but not one without enjoyment. It's an exciting time for Panuccio's singing career as he has just made a big artistic leap into the opera world. He was signed by Artistic Director Joel Revzen to sing Edgardo, in Donizetti's Lucia di Lammermoor with the company here in Tucson for one performance and two more at the acoustically-inviting Symphony Hall in Phoenix. The tenor seems in a reflective, but affable mood due to the fact that he is not only singing his first major role with an established regional opera company, but also that it happens to be as one of Donizetti's most beloved and tortured heroes. "I was quite happy the way things turned out yesterday, and I love this role. I think the role suits my voice." And the audience seemed to agree: when Panuccio stepped out on stage and sang Edgardo's anxious recitative in the secret encounter with his fragile, but faithful Lucia, what became immediately apparent was the way he spun out those Italian vowels in warm, rounded tones that would have made Pavarotti proud. Typical of many Italian-Americans, Panuccio was not encouraged to speak Italian at home. "I learned it from a textbook," he says, recognizing it as part of what needed to be done to further his career. Throughout the opera, both Edgardo's romantic pleadings and moments of terrifying outrage, and ultimately of despair, made it clear that this tenor has moved far away from his textbook days, on to the operatic stage with the language totally at his command. As for his vocal performances on October 6th and again on October 13th, he used a mixed style of singing not very much in vogue today. Like tenors from an older generation, such as Ferruccio Tagliavini and Giuseppe di Stefano, Panuccio has a knack for singing from mezzo forte to piano, particularly in those parts of the opera where it is vocally appropriate and where the sound is both warm and cleanly placed. When the voice increases to forte, it takes on a brighter diaphanous quality that seduces the listener much like Tagliavini and di Stefano used to do. "My friends say I have an older approach to singing which is fine with me," he quips. But what about the tenor's journey to get to where he is today? As with many young opera singers, his path has not been as rosy as the bios and the publicity pieces like to portray. He was born in Easton, Pennsylvania, and moved to Philadelphia in his early twenties searching for any opportunity to sing. While his time there is a little sketchy, we know he sang in the chorus of the Opera Company of Philadelphia. He states that on a "cattle call," one of those huge auditions companies hold to find out what the local talent has to offer, he met Donald Nally who is now Chorus Master at the Lyric Opera of Chicago. Panuccio started to work with Nally and has been with him ever since. "Don is my mentor; he taught me the interpretative and expressive parts of musicianship. I've been with him since the middle 90's." It was also during this time the tenor ran up against some bad luck. He auditioned for the Curtis Institute, one of the premiere musical schools not only in Philadelphia but in the country and "They didn't like what they heard, so I didn't get in." Not one to be disheartened, Panuccio applied to the Cincinnati Conservatory and was accepted. It was about then that he heard good things about Tom Barasel, a singing teacher at the Conservatory. "I decided that when I got there, Tom was going to be my teacher, so I called him up and told him that. Since he hadn't heard of me, he was surprised by my presumption." Panuccio did become his pupil and is still with Barasel today. "What he has taught me, is technique and the discipline that goes with it." The result of Panuccio's work with Nally and Barasel was evident in his Edgardo where the tenor's method of singing is so connected to his interpretative and expressive abilities. Although Panuccio was getting singing jobs in Cincinnati during the five years after graduating from the Conservatory in 2002, he found himself facing an unexpected and troublesome obstacle to having a major career: his weight. As Panuccio describes it, "After I graduated, I stayed mainly in Cincinnati where the opera company sort of became my second home, singing small parts, and people began to notice me." What he didn't count on was was going to after-performance parties all the time, eating, drinking and thoroughly enjoying himself. "I started to put on weight and before I knew it, I was over 300 lbs. 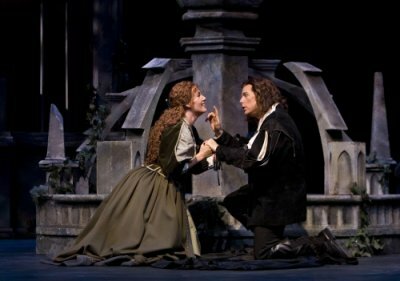 When I auditioned for my agent, Bernard Uzan, in May, 2006, he told me 'I like your voice, but nobody in the opera world is going to hire a three hundred pound tenor, no matter how good his voice is.'" Coincidentally, around this time, Panuccio had already decided to lose the weight, so he really took Uzan's words to heart. Just how did he manage to do it? To hear him relate it, he did it the old fashioned way," I was determined to do it right, through diet and exercise." However, Panuccio added a third method, one which he believes is the key to his successful weight loss. "I made a big change in my life style; I did it through a life-style change," he states emphatically, making sure everyone understands just how important all this has been to his career. And where does Panuccio's career stand now? After his successful experience with the Arizona Opera Company, his future looks a lot more secure now that he has lost the weight. "I'm determined to keep it off," he remarks as if going back to his former weight is an option that doesn't even exist. During the past five years, Panuccio has been singing mostly in Cincinnati, doing concerts and in repertoire, very different from his foray in Donizetti. "I love singing all those Neapolitan songs, and they seem to be a big hit with audiences," adding, "I also sang some of the verismo repertoire. I sang a Cavaradossi with a small opera company in Philadelphia which I liked very much." His comments lead to questions about other composers, such as Rossini. "My voice is not suited to Rossini, that tessitura is really high for me. I leave that to Diego Florez and Lawrence Brownlee; in Rossini, they are the best." His words lead him to make the necessary comparison, "You know, Florez doesn't sing Cavaradossi. " His roles for the immediate future include Raganeau in David DiChiera's new version of Cyrano for the Opera Company of Philadelphia and a return to Cincinnati Opera as Edgardo in their 2008 season. As Panuccio's career starts to move in a new direction - towards Romantic Italian Opera of the 19th century flooded with roles that easily fit his voice - does it really matter that he can't accommodate Rossini's endless fioriture when he has the heightened musical dramas of Donizetti waiting for him in the wings?